Short story awards: Sharmila was shortlisted for the Asian Writer Short Story Award 2009 and 2012. Featured in 5 Degrees anthology and read at the launch eve at Bush Theatre, London ! Oysters has also been adapted into a Short Film commissioned by Film London. There it is. The jacket. Hanging on the side of the chair, glowing in the morning light. Iridescent blue, with a tinge of green; its color vibrates like a deep bass string. Read more…. Rani died in her sleep. When I found her, the body was still warm. I stroked her head, marvelling at the quietness of her death. It was such a contrast to her illness. I wished I felt grateful that I hadn’t been there to see her go, but instead I felt cheated. I hoped that as she was pulled from this world, she had a moment to feel how much she had been loved. 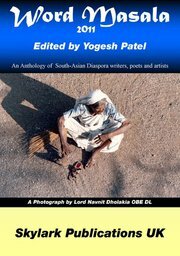 Published in Word Masala a collection of contemporary asian writing. You’re obsessed with my feet. Or so your father says. Yesterday he found you sleeping at the bottom of our bed; cheeks nestled inside my arches, hands cuddling my soles. He laughed and picked you up, took you downstairs. But it’s this morning that you take your first steps. Perhaps your obsession was more an imbibing of knowledge. A learning by osmosis from my feet to yours. You walk; one foot planted firmly in front of the other. A tiny waver along your spine as you acquaint yourself with this new height. You look amazed, delighted in the world before you. I lie back on the sofa and watch, mesmerised. You point upstairs and say daddy and I nod. Normally your father would get you breakfast. But today he is still asleep. Perhaps he floats through the remnants of our argument. Negotiating the sludge of our incomprehensible emotions. Perhaps that’s why he sleeps so long…. Sunshine sparkled through the grey afternoon. I sat in on the bench, wrapped in my own obliqueness. I was lost. I looked up at the clouds, at the tiny tapering ends, almost invisible. Was it an infinite haze of vapour droplets? I mused, watching as the black birds circled the pale billows. Suddenly the sun was gone; a cold hand on the shoulder of the transient warmth. I looked up pondering on how moistness in its most ethereal form could become so dull: how the radiance of the rivers, the energetic dancing of waves, all culminated in mournful grey. I lie in bed willing my pulse to slow down, but my heart just pumps faster, my brain overflowing with blood. I force my eyes to shut and my mind to surrender to the blackness. Diving into the middle of the bed, I curl up into a ball. Foetal position. Om Om Om. I chant. I can’t go back to sleep. Like a child on the eve of her birthday, I can only emulate slumber. My eyes snap open at every possible sound. Minutes pass as disjointed thoughts and dreams until, gradually, I give in to the uncontrollable rise of my consciousness.